Hurry over to get this Minnie Walk and Play Puppy Feature Plush for ONLY $12.33 (Retail $39.99)! No job is too small for Disney Junior's Minnie's Happy Helpers. 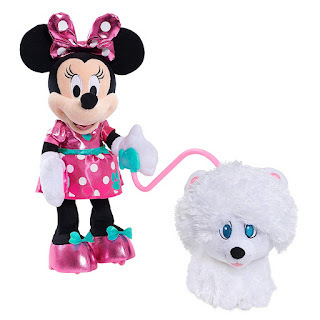 It's true puppy love for Minnie Mouse as she trains and walks sweet pooch Snowpuff. Minnie's Walk and Play Puppy Plush features two modes of play. First, use Minnie's clicker to teach Snowpuff to bark, spin, and dance. Then go on a dog-walking adventure together. Minnie sings and talks to her furry friend, and Snowpuff makes happy doggy sounds.